Effa Al Dabbagh is a Saudi designer, based in the UAE, but who studied here in the UK. She launched her first prêt-a-porter collection in 2006, followed by abayas in 2007. Her latest collection for Autumn/Winter 11/12 has just been launched, and is based on 1940’s glamour. I love the luxurious feel of both the abayas and dresses, with rich silks and satins in jewel tones a main feature, as well as pleat detailing and floral patterns. Many modest clothing designers tend to stick only to 'hijab' clothing, and ignore the fact that a lot of women also want fairly modest cuts even for ladies' only events. But I love the fact that Effa uses her talent to provide both abayas for outerwear, and beautiful evening gowns for special occasions. 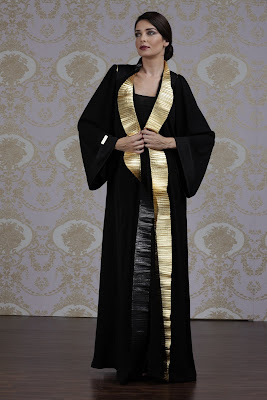 Effa's designs can be bought online at the 3abaya website. i love the printed white one in the last row, gorgeous! How are these worn with the hijab?